Beavers are considered engineers of the natural world. They can bring down trees 100x their size to build canals and structures which effectively modify an entire landscape. These engineers are common in the Don and Toronto’s ravines networks and they're making a mark on the landscape. 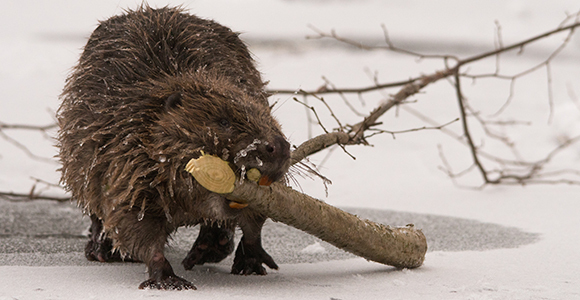 Jason Ramsay-Brown, President of Toronto Field Naturalists, explained that, though at times beavers are considered a nuisance, it’s important to consider their crucial role in curating the landscape. Beavers flood an area which presents an opportunity for new species to move in. When the dam decays and breaks, the landscape undergoes yet another ecological shift and new species move in. Over time, the landscape transitions from meadow to forest — until the next beaver arrives! While these long term changes may appear as inconveniences to humans, they support a flourishing, diverse ecosystem. So why do beavers build? Using their strong jaws and iron rich teeth, they gnaw down trees to build lodges and dams which effectively create more suitable habitats for their liking. The damming of a water course allows the area to flood and create deep waters for beavers to remain safe from predators (coyotes, wolves, etc). Interestingly, beavers seem to prefer native trees to invasive. So the hope that beavers would lead the fight against Toronto’s invasive trees is futile. 130,000 years ago, 200 lbs giant prehistoric beavers lived in this area. It's amazing to imagine them in this landscape and The Toronto Dreams Project Historical Ephemera Blog does a pretty great job painting the picture. Their front teeth stick out in front of their lips, so that they may cut and chew wood that is submerged underwater without getting water in their mouth. Beavers are among the largest living rodents in the world. Beavers eat the bark – not the wood. They build canals along the ground to float sticks and twigs to their lodges. Next time in the Don, look out for evidence of the beaver, chewed trees, dams or muddy beaver tracks along the banks and take a moment to consider how industrious and resilient these important creatures are to the ecosystem.